November 11, the feast of St. Martin of Tours, marks the official start of the Fasching/Carnivale Season, also known as the "5th Season" which continues for more than three months and ends six weeks before Easter. The last few days of Fasching are called Tolle Tagge, or Crazy Days, a time for indulgence before Lent. Fasching gets its name from the Fastschank, which is German for the last drink served before the Lenten fast. Principally observed in Catholic Bavaria, the holiday season resembles Mardi Gras or Halloween and is punctuated with parades, balls, and general merriment. 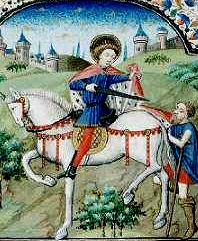 St. Martin and the beggar. The season begins in a low-key fashion at 11 minutes after the 11th hour on the 11th day of the 11th month. This marks the celebration of Martinstag, or the feast of St. Martin, Bishop of Tours, who died in 397 A.D. It is said that he converted the Visigoth King to Christianity and was the patron saint of the Merovingian Kings of France. But perhaps he is best known for his generosity. As an 18-year-old officer in the Roman army, this son of a powerful Hungarian family converted to Christianity and was baptisted. When he saw the hardship of the poor people of Gaul, he was so moved that he cut his fine red Roman officers cloak in half and gave it to a naked beggar. That night he had a dream that Jesus was wearing his cloak, and when he awoke, he found his cloak was made whole. Martin spent most of his life living as a hermit or among the poor with whom he identified. After their bishop died, the people of Tours chose Martin to be the next bishop. He refused to live in the bishop's mansion or wear fine clothes. He lived among the hermit monks in the caves across the river Loire and administered the bishopric through his followers. Though he fasted and toiled his whole life in self-imposed poverty he lived to be 80 years old. So how in the world did St. Martin become associated with a season of indulgence and excess? It turns out that the Bacchanalian celebration of the grape harvest coincides with his feast-day and the Bacchanalian holidays for celebrating the fermented wine happen to fall just before Lent. In ancient Rome, the cult of Bacchus was mainly a women's fertility religion celebrated with many drunken orgies in the groves near the Aventine. It is said that women kidnapped men and threatened to kill them if they didn't participate in their wild abandon. But this was rarely a problem because the men considered it their civic duty to join the festivities. The women dressed as nymphs and fairies and the men as satyrs, covering their legs with goatskins and carrying horns. Everyone wore garlands of ivy, grape vines, or pine boughs, and danced in the streets. There were frenzied parades where men sang sexually suggestive songs and carried long poles hung with phalli and the first flowers of Spring. 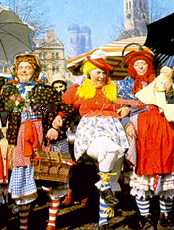 Young women in costume carried baskets of raisins and fruit cakes of all sorts to toss to the spectators. These parades ended in riots so often that the government of Rome tried to suppress them many times. Bacchus worship was observed in The Roman Colony of Claudia Ara Agrippinensis, better known as Cologne (Köln), Germany, so the tradition persisted long after Rome had fallen. From Cologne it spread to all the Roman regions of central Europe. With the coming of Christianity a veneer of religious observance covered the pagan festivities. By the 12th century the basics were all there. Merchant guilds formed krews to create more and more elaborate floats for the parades, held masked balls, and erected temporary beer halls and stages for listening to ribald songs, amateur plays, as well as drinking to excess. The tone of Fasching was often lewd and suggestive and included a large dose of mockery which offended the rich and powerful. Martin Luther and the Protestant reformation stamped out the practice in many parts of Germany but Fasching continued uninterrupted in the Catholic areas in the south. Though the season lasts nearly 17 weeks most of the time is spent in preparation for the last six days known as Crazy Days, with the craziest day being Weiberfastnacht, the "Women's Carnival." In Cologne it is held on the Thursday before Ash Wednesday in the Old Market near the Romanesque church of Gross St. Martin. It begins with dancing—the women pulling men from the crowd—and continues wildly throughout the streets during the day, ending in the taverns, bars and beergartens of the old quarter. In Munich, women carry large scissors with them to cut off men's neckties if they won't dance. On "Sooty Friday" the revellers smudge their faces with soot and dress like beggars. "Fat Saturday" is a day of feasting that leads into the Herrenfastnacht, or "Men's Carnival." 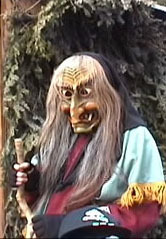 In the Alpine areas only men participate in the parades and plays wearing frightening carved wooden masks embellished with goat hair and teeth. The wildest parades and merriment are held on Rosenmontag which has nothing to do with roses, but actually means "Raving Monday." In 1986, according to the New York Times, on Rosenmontag "as many as a million people—more than Cologne's population—lined the streets and squares along the four-mile route through the historic center. The last show was staged by more than 7,000 carnival buffs, 56 bands, 46 drum and fife groups, 300 horses, and more than 120 elaborately decorated floats and wagons." The final day is Fastnacht, which means "the eve of the fast," and children's parades and parties are held in the afternoon before the serious drinking begins. In Mainz, a Prince and Princess of Craziness are elected to reign from City Hall on Fastnacht. In the United States, you can find similar festivals like Mardi Gras in New Orleans, the New Year's Mummers Parade in Philadelphia, and St. Patrick's Day celebrations in New York that have been a fixture for hundreds of years but nothing that rivals Fasching for its ancient origins, long unbroken tradition, or sheer stamina. This season Martinstag kicks things off on Sunday, November 11, 2007 and Rosenmontag will fall on Monday, February. 4, 2008. What was the cult of Bacchus all about? If you want to add this article to your list of favorites or email it to a friend, please use this permanent URL, https://stores.renstore.com/-strse-template/0709B/Page.bok. Permission is granted by the author to quote from this page or use it in handouts as long as you include a link back to Renstore.com.